Confered by H.E. President of Pakistan Mr. Mamnoon Hussain. Decorated on 14th Augest 2015.
accompanied by his wife Mrs. Subha Laxmi Sakya on 19th June 1979. With highest respects and regards, the President of Nepal Journalists Association Mr. Manju Ratna Sakya presented the “Nepal-International Peace Award” addressed to His Excellency Great Leader of the Korean People KIM JONG IL to H.E. Mr. Yang Hyong Sop, Vice President of Supreme People’s Assembly at the special function in Mansudae Hall of Pyongyang on 7th Sept. 2008. This prestigious award was unanimously decided to decorate to His Excellency Great Leader KIM JONG IL, General Secretary of the Workers’ Party of Korea, Chairman of the National Defence Commission of DPRK and Supreme Commander of the Korean People’s Army wishing a good health, long and long life and prosperity of His Excellency the Great Leader KIM JONG IL by Nepal Journalists Association in Kathmandu on 28th April 2008. With highest respect and regards, Nepal Journalists Association (NJA) presented “PEACE AWARD 2009” to His Excellency Great Leader KIM JONG IL, General Secretary of the Workers’ Party of Korea, Chairman of the National Defense Commission of DPRK and Supreme Commander of the Korean People’s Army for the contributions made by The Great Leader last year for Korean reunification, Independent cause of human and world peace. The peace and stability in the Korean peninsula and its region is firmly guaranteed by Songun policy originally enforcing by His Excellency Great Leader KIM JONG IL. Reflecting the desire of the Nepalese people and progressive people of the world, NJA had decided to decorate PEACE AWARD 2009 to His Excellency Great Leader KIM JONG IL. Wishing a good health, long life and prosperity of His Excellency Great Leader KIM JONG IL, NJA unanimously decided to decorate the highest PEACE AWARD 2009 to His Excellency Great Leader KIM JONG IL at its grand meeting which was held in Kathmandu. With highest respect and regards, Nepal Journalists Association (NJA) for Studying the Juche Idea and Songun Policy presents “Nepal-International Peace Award” to President KIM IL SUNG, Great Leader Comrade KIM JONG IL and Anti-Japanese Heroine Mother KIM JONG SUK who are the “Three Great General of Mt. Paektu” on the Happy Occasion of 100th Birth Anniversary of President KIM IL SUNG. 2012 is very meaningful year when we would celebrate the 100th Birth Anniversary of President KIM IL SUNG, 70th Birth Anniversary of Great Leader Comrade KIM JONG IL and 95th Birth Anniversary of Anti-Japanese Heroine Mother KIM JONG SUK. In praise of the “Three Great Generals of Mt. Paektu” outstanding contributions to Korea’s revolution and the cause of global independence and the world peace, the NJA for Studying the Juche idea and Songun Policy unanimously decided to confer “Nepal-International Peace Award” on them at its grand meeting held in Kathmandu on 24th December 2011, reflecting the desire of the Nepalese people and the progressive people of the world. The Nepal-International Peace Award 2012 was presented to His Excellency Mr. Yang Hyong Sop, Vice-President of DPRK by NJA President Mr. Manju Ratna Sakya amidst a special ceremony in Pyongyang on 15th April 2012.
a) The Vice-President of the Presidium of Supreme People’s Assembly of DPRK His Excellency Mr.Yang Hyong Sop decorated the Friendship Medal to President of Nepal Journalists Association Mr. Manju Ratna Sakya amidst a special function at Mansudae Assembly Hall in Pyongyang on 17th Feb. 2007.
b) The Vice-President of the Presidium of Supreme People’s Assembly of DPRK His Excellency Mr.Yong Hyong Sop decorated the highest Friendship Medal to President of Nepal Journalists Association Mr. Manju Ratna Sakya amidst a special function at Mansudae Assembly Hall in Pyongyang on 7th Sept. 2008. The Certificate of honour to The Great Leader President KIM IL SUNG and Great Mother of Korea KIM JONG SUK were handed over by President of Nepal Journalists Association Mr. Manju Ratna Sakya to the Vice-President of the Presidium of Supreme People’s Assembly of DPRK, His Excellency Mr.Yang Hyong Sop in Pyongyang on 15th Feb. 2007. The Certificate of this honour to Great Leader KIM JONG IL, General Secretary of the Workers’ Party of Korea, Chairman of the National Defense Commission of DPRK and Supreme Commander of the Korean People’s Army was handed over by President of Nepal Journalists Association Mr. Manju Ratna Sakya to His Excellency Hwang Yong Hwan, Ambassador of DPRK to Nepal at the special function in Kathmandu on 30th March 2005. With highest respects and regards, Nepal Journalist Association (NJA) takes great privilege to register His Excellency Comrade General KIM JONG UN as “The Honorary Special Member of NJA” in praise of his great service to the Korean people, the peaceful reunification of Korea, independent cause of human and world peace on the auspicious occasion of his Happy Birthday. NJA sincerely wish His Excellency Comrade General KIM JONG UN would firmly success and develop Juche cause. 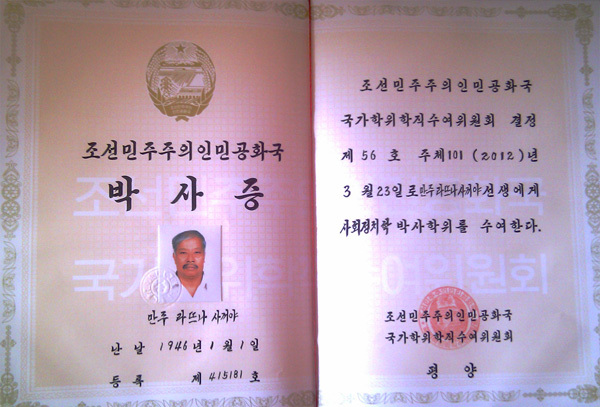 The Honorary Special Membership of Supreme Leader of KIM JONG UN was presented to His Excellency Mr. Yang Hyong Sop, Vice-President of DPRK by NJA President Mr. Manju Ratna Sakya amidst a special ceremony in Pyongyang on 15th April 2012. This Newspaper is continuously contributing to strengthen further the friendly mutual relations between Nepal and DPRK. In each and every Friday issue of Arpan Weekly the news and articles on DPRK is publishing regularly since 54 years from Kathmandu, Nepal. The Vice-Premier of the Govt. of DPRK, H.E. 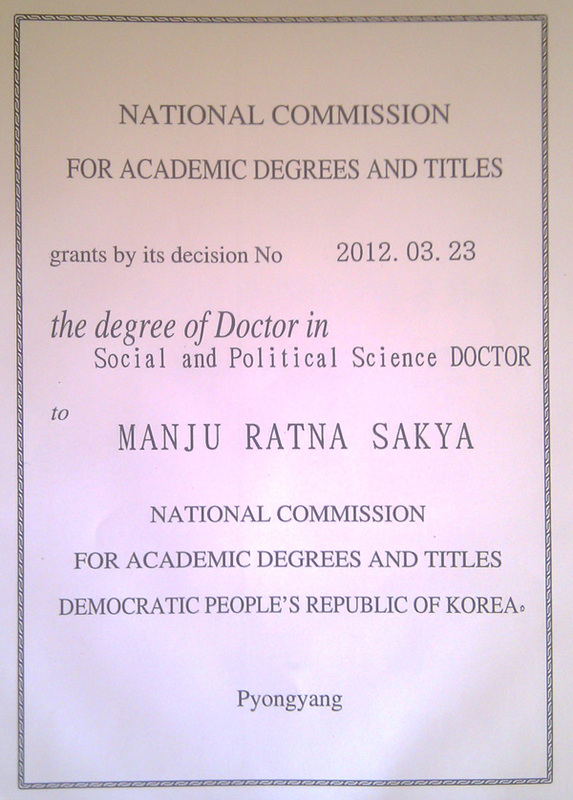 Mr. Ro Tu Chol decorated the DEGREE OF DOCTOR to Mr. Manju Ratna Sakya on the Thesis of “The Great Juche Idea and the DPRK” at Supreme People’s Assembly Hall in Pyongyang amidst a special ceremony on 16th April 2012.
a) With Nepalese Cultural delegation in 1978.
b) Leading Nepal journalists delegation from 12th -22nd June 1979. SUNG on 19th June 1979.
c) Leading Nepalese journalists delegation from 7th -19th March 1980.
d) Leading Nepalese journalists delegation from 8th -18th October 1980. Anniversary of the Founding of the DPRK from 6th -11th September 2008. Anniversary of the Founding of WPK from 6th -11th October 2010. Anniversary of President KIM IL SUNG from 5th -17th April 2012.
j) Leading Nepalese journalists delegation on the occasion of 70th Anniversary of Founding of WPK from 6th -15th October 2015.
k) Leading Nepalese journalists delegation on the occasion of 105th Birth Anniversary of President KIM IL SUNG from 13th -20th April 2017.
l) Leading Nepalese journalists delegation on the occasion of 70th Foundation Day of DPRKfrom 6th -13th Sept 2018.